Now let’s get to the points I want to share with you. 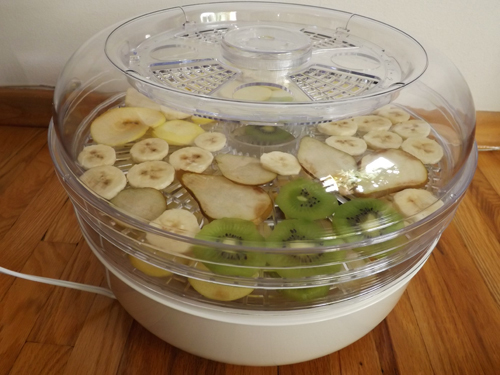 Machine: You could buy “fruit dehydrators” with a built-in fan, which is a bit pricier but more efficient, or the ones without fan, which takes a bit longer to dry your fruits with heat alone , but still does the job. The picture above shows the latter type with 4 trays. Choosing fruit types: Basically, you can dry any type of fruit and vegetable. In my opinion, though, citrus family is not appropriate for this purpose. Go for sweeter fruit types, such as pine apple, banana, pears. And among a given fruit variety, go for the sweeter type. For example, apples are excellent candidate for dehydrating, but take a note that green apples are not as sweet as red or yellow ones. Having said that, do experiment with unusual fruits, such as Kiwi and boiled beets, to add some diversity and color to your serving dish. Choose ripe, but not over-ripped, fruits for dehydrating. Also, seasonal and inexpensive fruits obviously make more economic dried fruits than fancy and pricey ones. Preparing your fruit: Wash and completely dry your fruits. Some fruits, such as apple and pears do not peeling. 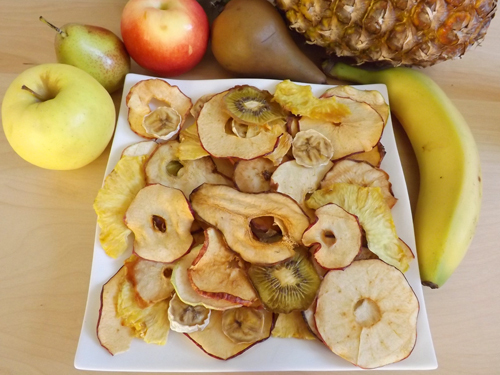 Slice your fruits super thin to get crispy dried, or medium thin to get chewy dried fruit. But in any case, try to slice them in equal sizes. If you have a cutter, the task would be much easier, but don’t worry if you don’t. With a little patience and practice, manually sliced fruits will look just as great. Time: The time required for drying fruits varies depending on the type of fruit, the thickness of each slice, and the degree you want it dried. Pineapple, for instance, takes more time to dry because it contains more water/juice than, let’s say, apple. My slow machine takes about six hours to give me crunchy apples when I spread them on the first try closest to the heat, and about eight hours to give not –too-thin-and-dry pineapples. Dried fruits are healthy, delicious and inexpensive when made at home. Take them with tea as dessert and/or as snack. They make great gifts too once placed in fancy empty chocolate containers. And one last thing: in the process of drying and afterwards, your house will smell like fruits! Refreshing and pleasant. I love that part as much as the dried fruit itself!